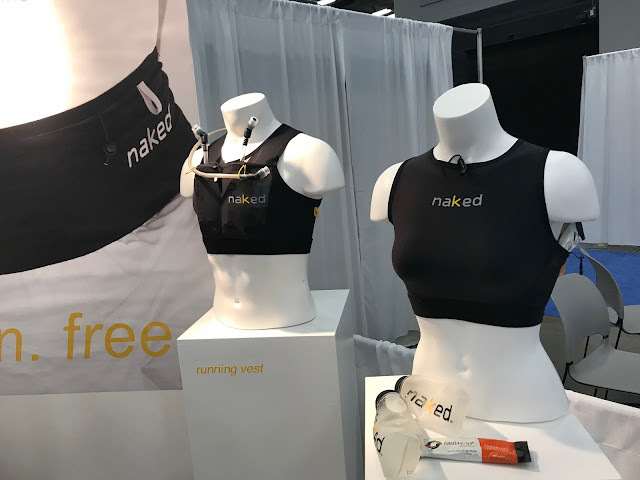 Naked Running really surprised at The Running Event with among the most innovative, if not the most innovative, run accessory we saw, a pair of gender specific minimal carry systems, the Naked Running Vest and the Naked Running Bra. All of us at RoadTrailRun are huge fans of their Naked Running Band, the latest version is reviewed below. The men's is a snug fitting 3.5 oz vest made of the same stretch mesh fabric as the Naked Running Band. It is really a snug stretch mesh "crop" with 2 soft flask 500-600 Ml) pockets on the chest and a full length kangaroo pouch on the back. It has a shock corded safety whistle at the neckline and reflective highlights. The rear pouch can hold a hydration bladder and/or clothing and poles. Given the snug stretch fit we suspect there will be minimal motion with a smaller 1.5 L bladder but will have to test. It will come in 12 sizes and is designed to worn next to skin or over clothing. The 3 oz. 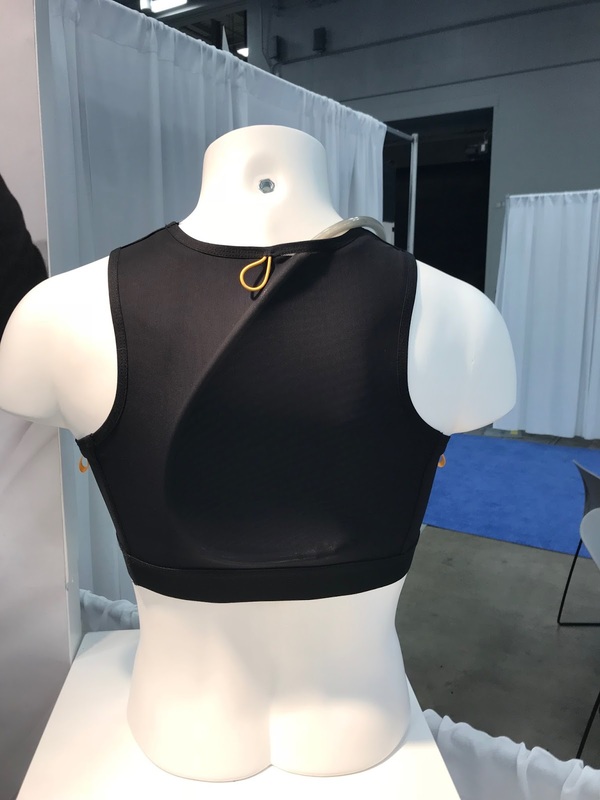 Naked Running Bra will also come in 12 sizes for a precise fit. It is made of Schoeller ColdBlack fabric in front, Naked Running Band stretch mesh in back.The ColdBlack treated fabric reduces thermal radiation absorption and is UVA-UVB protective to protect the skin and reduce heat build up. The fabric is said to be highly breathable. The Running Bra has 2 side pockets and a rear compartment for hydration, poles, jacket, etc.. The rear compartment is shallower than the men's Running Vest. It is outfitted with a safety whistle on a shock cord at the neckline. 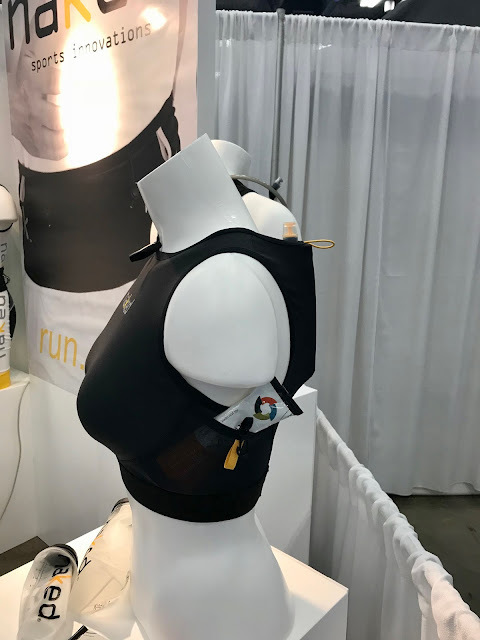 Back in April, Sam, Peter and Jeff reviewed the Naked Running Band and absolutely loved it, all giving it a near perfect score or perfect score for it's amazing no bounce on the waist carry capacity and all around versatility (April review can be found here). Read our original review, as it contains the majority of the key details and this review will focus on the differences of the new version. The latest version has a few key changes to distinguish itself from it's predecessor. The Naked Running Band can easily hold 3 500ml soft flasks with minimal to no bounce. The stretch loops on the back have been spaced further apart and each loop is larger, adding to it's versatility and can more easily accommodate a pair of folding trekking poles. 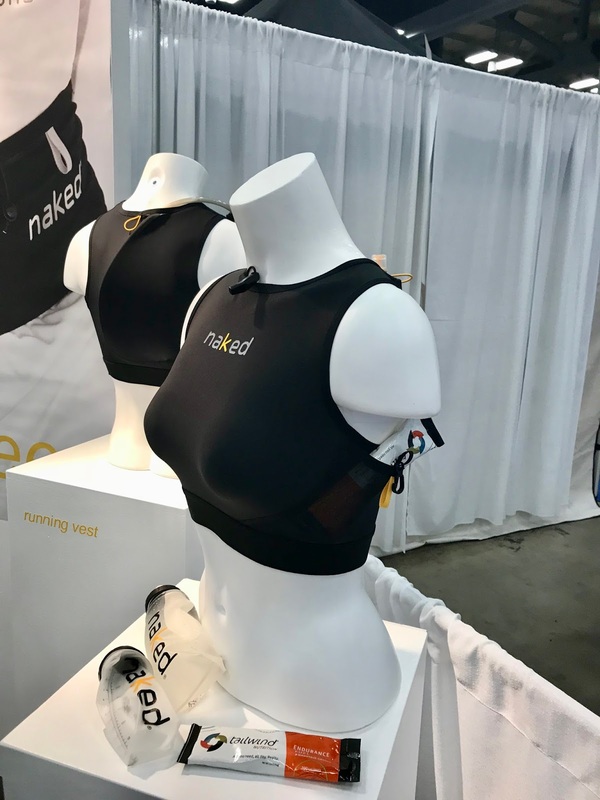 Jeff: I am a huge fan of the Naked Running Band and since receiving one for review early this year, it has accompanied me on most of my runs since and was the first time I have given a perfect score. I use it primarily to carry my phone, a light windbreaker and some food, or often just for my phone depending on which shorts I am wearing. In addition to using it for running, I also use the Naked Running Band for cycling, as it is an ideal way to safely and securely carry along my phone and wallet without worry of losing either out of a jersey pocket (also freeing the pockets for more quick access items like jacket, gels, arm warmers, etc...). The newest version, though still an amazing product that I highly recommend to anyone who runs or bikes, was a slight step back for me. First, sizing, though now accommodating a wider range of sizes, each size option is so precise, it is hard to dial in perfectly without trying 3 or 4 or them side by side. My waist measures 32" and when I chose the last version, I opted for the 33-34" size V just to be on the safe side. It fit me perfect, snug enough to keep everything in place, but never restrictive or confining. I will say that after 6 or 7 months of daily use, it did stretch a bit and when loaded with water and my phone, I did notice it sagging a little bit under the weight when running fast down hill. With the new version, I went with 32", figuring it may be a touch snug at first, but if it stretched just a little like my first version, it would overall be the appropriate choice, but when I received the new 32", I could hardly pull it up past mid thigh. Lindsey at Naked Sports Innovations kindly sent me the next size up, a 33", which was better, but still a bit tight and confining and probably should have gone 2 sizes above my measurement for a 34". The newer version does not seem to have enough give and flexibility to accommodate bodily fluctuations during a run, where I may start a run somewhat full from breakfast and then finish up a few lbs. lighter. The 3 pocket configuration allows for better fit of 500ml bottles, but I honestly had no problem fitting them into the smaller pockets of the previous 4 pocket design. This is just personal preference, but I like 4 pockets better, as I never had trouble fitting my expected carry items (phone, windbreaker, 500ml flask, food) into any of them and found it to carry the load more symmetrically with better organization. The improved pole loops greatly ease the ability to carry poles, but still takes a bit of fidgeting, especially if you have full size baskets, though I found that to be inconsequential, as I don't often run with poles and if I do, I will likely be using a run vest or pack. With the new band, I can easily fit 4 fingers through the pole loops. With the old, I could only fit ~2.5 fingers. Overall, this is an amazing product and I highly recommend it to anyone who is looking for a simple and effective carry solution for a smartphone and a few essentials. It breathes new life into shorts I otherwise stopped using in favor of shorts with better pockets, but with the Naked Running Band, that is no longer an issue. Sam: The Naked Running Band is my companion when I need to carry a phone, car keys, and a few extras beyond. It is simple, highly functional and versatile. I prefer the new 3 pocket design as previously not only were the 4 pockets a tab small but it was also harder to find their openings. Now access pretty much anywhere on the Band front or back is instant with fuss. I appreciated the wider pole and jacket loops on the new version although the only way for them to be accessible for my pole placement and removal was with the poles worn on the front. I found the initial fit at my measured pant size 32 very snug and should have sized up one size. This said over time it has stretched somewhat and is now fine. The snugness of the Naked Running Bands is usually noticed when standing around or sitting and not actually when running. Naked told us at the Running Event that while not changing the sizing scheme future batches may relax a bit. - .1 for 3 pockets vs. the 4. This is of course personal preference, but the 4 pocket design works much better for me. -0.3 for overly snug fit at my size and resulting strain on the stitching when new. 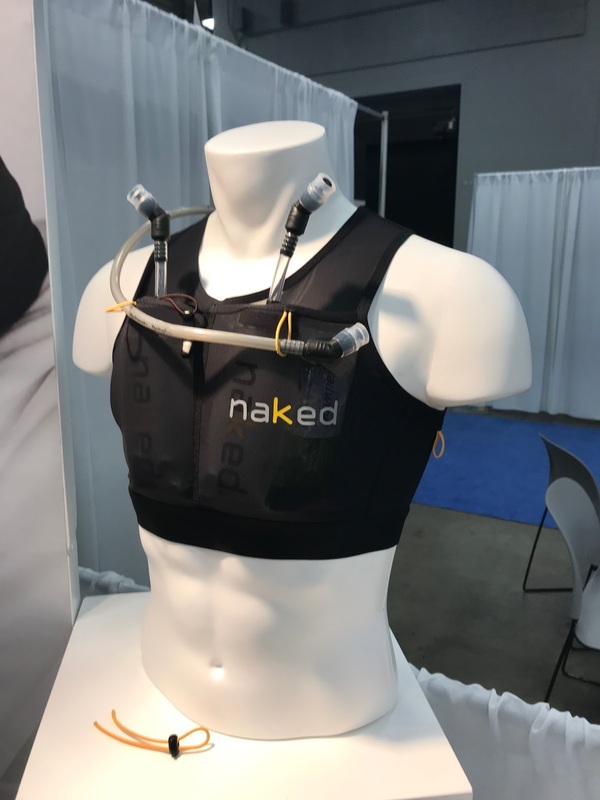 Any recommendations for non leak soft flasks to use with the naked running band v2?